As a jury decides her life or death, Jodi Arias once again sat down with Phoenix Arizona’s KSAZ FOX-10 and ABC after giving a 19-minute speech asking jurors not to give her the death penalty. 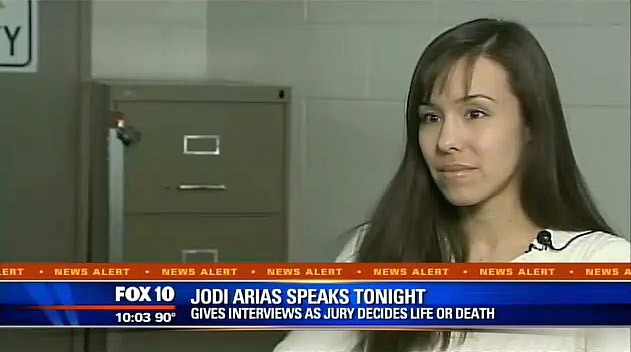 You can watch the Jodi Arias death penalty deliberations interview below. In the interview, Arias opens up about why she no longer wants the death penalty, why her mother didn’t testify as a character witness and explains the controversial “Survivor” t-shirt she displayed in court. The jurors will continue to deliberate to determine whether Arias is sentenced to life in prison or death via lethal injection. Tania Raymonde (Texas Chainsaw, ABC’s Lost) will play Jodi Arias in Lifetime’s TV movie, Jodi Arias: Dirty Little Secret.